We would like to invite You on board our beautiful motor yacht Majesty 66 (2010). We have 4 cabins (all with private bathrooms) for 8 people: 1.Master Cabin (the biggest, wardrobe, couch, Queen size bed) 2.VIP Cabin (very big, Queen size bed) 3.Cabin with 2 single beds (medium, parallel beds) 4.Cabin with 2 single beds (small, bunk beds) Our guests enjoy a spacious living room, full equipped kitchen (refrigerator, ice maker, electric hob, microwave, dishwasher), water equipment and many other attractions. 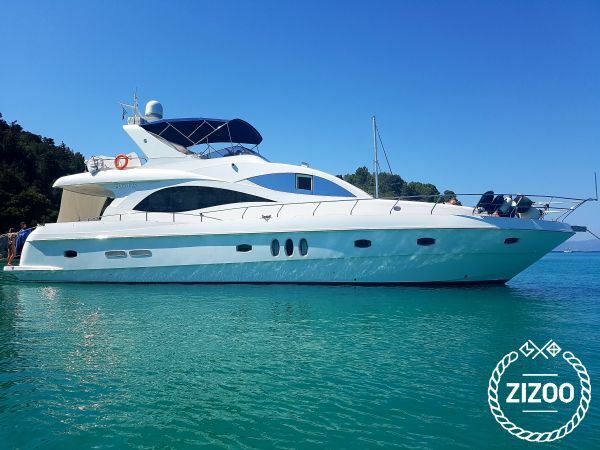 Majesty 66 is the perfect yacht for a fantastic vacation for large family or group of friends wanting to relaxing cruise in Greece. Our port is Gouvia Marina in Corfu, we are sailing in Ionian Sea: Corfu, Paxos, Antipaxi, Sivota Islands, Parga, Lefkada, Kefalonia, Zakhyntos, Scorpios, Meganisi, Ithaka. Every evening after sea journey we are staying with our guests in Greek small towns or picturesque bays. We are a crew of 2, Captain has almost 30 years of experience in steering motorboat.